Habit: Annual 10--30(40) cm; proximal hairs +- cobwebby early, +- gray, 0 by flowering time. Stem: generally 1--12; branches generally proximal. Leaf: basal, withering, and +- cauline, 1--7(10) cm; largest blades linear, cylindric, entire, or +- elliptic, flat, 1-pinnately lobed, +- fleshy, nonglandular; lobes generally 1--2(5) pairs, tips +- cylindric. 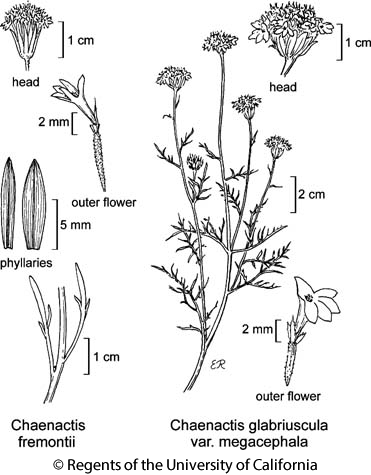 Inflorescence: heads radiant, generally 1--5 per stem; peduncle distally generally glandular-hairy, or +- glabrous in fruit; involucre +- obconic to hemispheric; longest phyllaries 8--10(12) mm, outer +- glabrous in fruit, tip erect, stiff, acute. Flower: corolla white to +- pink, inner 5--8 mm, outer bilateral, spreading, > inner. Fruit: (3)6--8 mm; inner fruit pappus of 4 scales in 1 series, longest 6--8.5 mm, tips visible among buds. Chromosomes: 2n=10. Unabridged Note: Prominent spring wildflower in lower deserts; eaten by desert tortoises. Citation for this treatment: James D. Morefield 2012, Chaenactis fremontii, in Jepson Flora Project (eds.) Jepson eFlora, http://ucjeps.berkeley.edu/eflora/eflora_display.php?tid=1973, accessed on April 21, 2019.
s SNF, Teh, s SnJV, SCoRI, n&e edges SW (exc ChI), s SNE (exc W&I), D; Markers link to CCH specimen records. Yellow markers indicate records that may provide evidence for eFlora range revision or may have georeferencing or identification issues. Purple markers indicate specimens collected from a garden, greenhouse, or other non-wild location.